The TSI Model 4040 is a mass flow meter from TSI that is designed for various gals flow measurement applications. 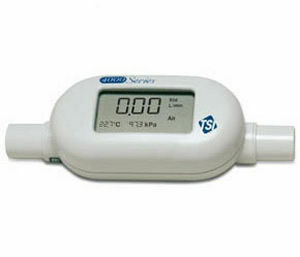 This device delivers an accurate measurement with multiple data output options. The display versions are delivered with complete accessories that makes set up and operation quick and easy. TSI mass flowmeters are designed as two percent of flow rate reading. A single TSI mass flow meter covers the same range as three percent of full scale devices with good accuracy. It generates a quick 4 millisecond response that guarantees quick reading of accurate fluctuating flows. The fast response time allows closed loop control systems and integrated volume measurements. It also has a low pressure drop that reduces the back pressure on flow circuits and minimizes the impact on the system.